Sudbury Town Mayor Cllr. Jack Owen, South Suffolk MP James Cartlidge (left) and Lord Phillips of Sudbury OBE were among the thirty guests, volunteers and staff present at the Kernos Centre’s 12th AGM on Friday 22nd January to hear about the vital work the Kernos Centre continues to do in counselling local people suffering with emotional and psychological problems. Kernos Chairman Graham Hill, on behalf of the Board, thanked everyone attending the event at the Christopher Centre in Sudbury for their interest and support, especially Cllr. 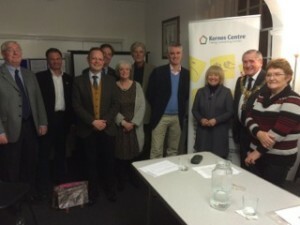 Owen for choosing the Kernos Centre as one of the Mayor’s charities to be supported during his term of office. Suffolk County Council – through the Suffolk Community Foundation – Babergh District Council and Sudbury Town Council were also thanked for their continuing donations and grants. These have helped enable Kernos to support in excess of 2,445 clients – aged from 6 to 93 – since its opening in March 2003. Kernos Treasurer Peter Brown pointed out that: “Donations, client contributions and fundraising make up more than half of the Kernos Centre’s revenue. Over 50% of the hours needed to provide counselling support are given free by our therapists, staff, volunteers & directors. However, we are continually seeking additional funding in order to properly support those who need help”. He went on to say: “When you consider that a hospital bed for a mental health patient can cost anything up to £150,000 a year, it is clear that early intervention by Kernos is not only good for those who need help but also makes sound financial sense for the community”. 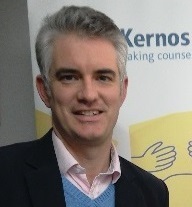 After viewing three short films – ‘Young People Having A Voice in their Wellbeing’ – created by, and starring, local young people, which graphically depict some of the psychological problems impacting on their mental health and wellbeing, Lord Phillips thanked the Kernos Centre for the amazing work it is doing for people in Sudbury and the surrounding villages. Cllr. Jack Owen expressed his continued support for the Kernos Centre and Cllrs. Lee Parker, Adrian Osbourne and Jan Osbourne also expressed to the Kernos Board how worthwhile is the work the Kernos Centre does and how important it is that the Centre should be able to continue. Other attendees also spoke about, and gave examples of, the ongoing need in Sudbury for the services of Kernos. Hannah Seymour, Health and Children Centre Team Manager of the Phoenix Children Centre in Sudbury wrote: “We work with families who struggle with mental health, debts, domestic violence, childhood trauma and parenting problems. You have supported us in achieving the best possible outcomes…I sincerely hope our relationship with Kernos continues long into the future”. The day following the meeting James Cartlidge MP tweeted “Humbled to hear the incredible work done by volunteers of @KernosCentre Sudbury. At AGM agreed to help press for funding”.